In this post we have put together a comprehensive list of some of the best well written text effect tutorials we found on the web. Best of 2015, Photoshop and Illustrator text effect tutorials are for those who really love to make outstanding typography, calligraphy type artwork. In this Photoshop tutorial you will learn how to create an orange fruit text effect using simple tools and brushes. This tutorial by TutsPlus will show you how to style and texture a rusty text, then add some flames using the filter, along with some other smoke and sparks textures to create a vibrant flaming text effect in Adobe Photoshop CC using the new Flame Filter. Learn how to create a winter themed type in Photoshop with this frosty effect, with icicles and all. In this video Photoshop tutorial by PSDVault, you will learn how to perform Snow Painting and Ice Texturing with a few simple Photoshop tools. This tutorial is inspired by the kooky and downright awesome titles from the 1940s / 1950s B-Movies. In this walkthrough you will be using type, compositing and processing techniques to create a creepy logo loosely based on the ‘The Thing From Outer Space’ (1951) title sequence. Ridiculously Realistic Scorching Fire Effect! 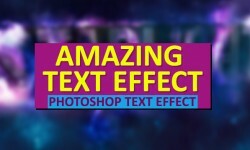 Here is a tutorial built in Adobe Photoshop CS3 that you can use to give your text a scorching reality. This can also be applied to other shapes. The idea is very simple, I used some stock photos and a very blocky typeface. Instead of wasted my time looking for the perfect font, I decided to create it in Illustrator. 3D text effects are a growing and awesome design trend. They can add angles, lighting and interest that many 2D text effects can’t bring. Here is an awesome Showcase of 3D Typography that was put together a little while back by Angie Bowen. In this quick tip tutorial we will demonstrate how to create a cinematic “Sergeant America” Text Effect using the layer styles. Let’s get started! This tutorial will show you how to use a dotted font, with a couple of layer styles, to achieve a simple, glittering diamonds text effect. In this tutorial, I will show you the steps I took to create this Mysterious “Energy Flow” rock text effect in Photoshop. We will use a rock texture, river flow stock image, and cloud brushes to achieve this effect. The rock texture will form the foundation of the text, whereas the river stock will be used to create the “Energy Flow” around the text. In this tutorial you will found that adding an extra step to this known technique, enables you add transparent gradients to text in Illustrator CS4 while still keeping the text editable! Learn how to create a super cool illuminated text effect using Photoshop’s 3D Layers. We’ll make your text really stand out by making it glow. Read on to find out how.